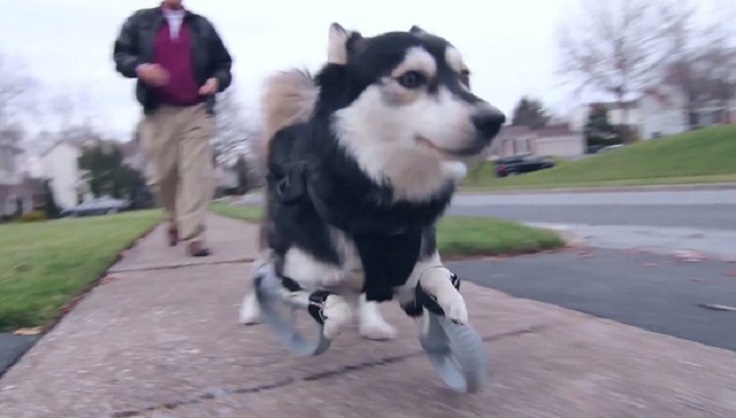 Dog Runs For The First Time In His Life Tanks To 3D Printed Legs. This beautiful pup named Derby was brought into this life with some shortcoming, but that did not keep him down for long! “He has always been the happiest dog I know,” Derby’s adopted mom, Sherry Portanova told The Dodo. According to the story on The Dodo Derby was born with underdeveloped front limbs, and although he was otherwise a healthy dog, that one difference nearly caused him to be put down. The young dogs original owners decided they did not want him anymore, and he soon wound up at the Peace and Paws Dog Rescue Shelter in Hillsboro, N.H. But he wasn’t unwanted for long. Derby was finally placed in to the welcoming arms of a new family. Not only were they compassionate enough to save his life, but also equipped with the know how to improve it too. That person was Tara Anderson, director at 3-D Systems, a company that specializes in 3-D printing. When she heard about Derby’s condition, she knew she had to do her part to give him a second chance – and perhaps find a solution to his mobility limitations. After she took Derby in, she made a customized wheelchair to make it easier for him to get around. Although that was helpful, she knew her team of designers could do better. That’s when the skilled staff at 3-D Systems started crafting a custom set of prosthetic legs that would not only help Derby to move more naturally, but it would also allow him to live out the rest of his life as an energetic pet with full potential. If Coke Told The Truth, It Would Look Something Like This….